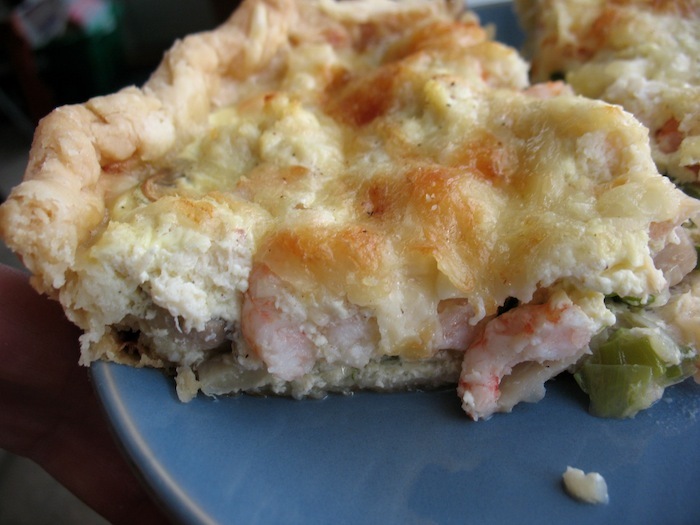 Forget boring quiches, this one takes things up a knotch by using succulent crab and shrimp to make things special. My family, who doesn’t always love quiche, adores this recipe. Serve this at a Christmas or Boxing Day brunch along with a beautiful salad, some fruit, and and buns to make it a meal. You could skip the mushrooms if the family doesn’t like them, but I think they add a wonderful flavour. Quiches are a fantastic addition to a brunch or potluck table. They are easy to make and can be adjusted to your liking. The leftovers are always delicious, and eggs make a great meal. Try it! Pre-heat the oven to 425°F. Prick the bottom of the pie crust in a few places gently with a fork, then line the pie plate with some foil, covering the crust. Bake the crust for about 10 minutes with the foil covering it, then take off the foil and bake 3 minutes longer. Take the crust out of the oven and let cool. Reduce the oven to 350°F. Saute the mushrooms in butter over medium heat in a skillet until browned. Add the onions and saute about a minute more. Remove the pan from the heat and scatter the mushrooms and green onions into the bottom of the baked pie shell. Next, sprinkle over the crab, shrimp, and cheese. In a medium sized bowl, beat the eggs and cream together with the nutmeg, salt and pepper. Pour into the pie shell, trying to evenly coat everything. Bake 35-40 minutes or until the filling is firm in the center.